Mr March said: "I'm very nervous but we've got plenty of people around to keep motivated." His fellow contender and counter-weight said: "Richard's probably not going to hear the end of me while I'll be chatting away to him trying to keep myself awake." Mr Jones' father-in-law, David Turner, spent three months building the machine from scavenged timber, motorcycle suspension parts and a trampoline. He said each man achieved about three hours' sleep on Saturday night, while the other used pull-ropes to continue the see-saw's motion. "Obviously four days to keep awake is quite a task so what they'll have to do is do shifts in the night," he said. 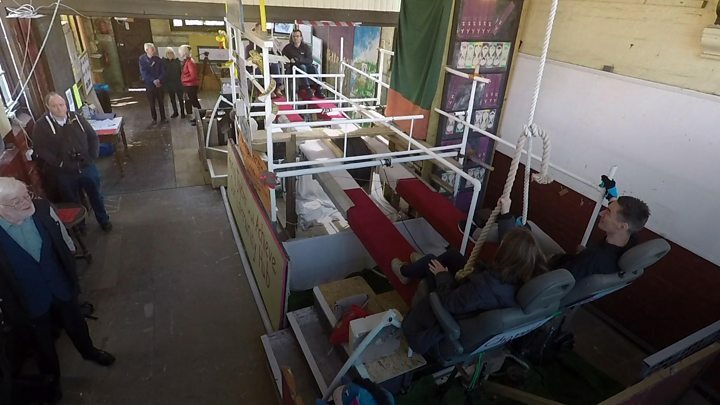 The pair are trying to sleep in reclining car seats as they move up and down, although the machine's toilet, in a cubicle in the centre, is stationary.